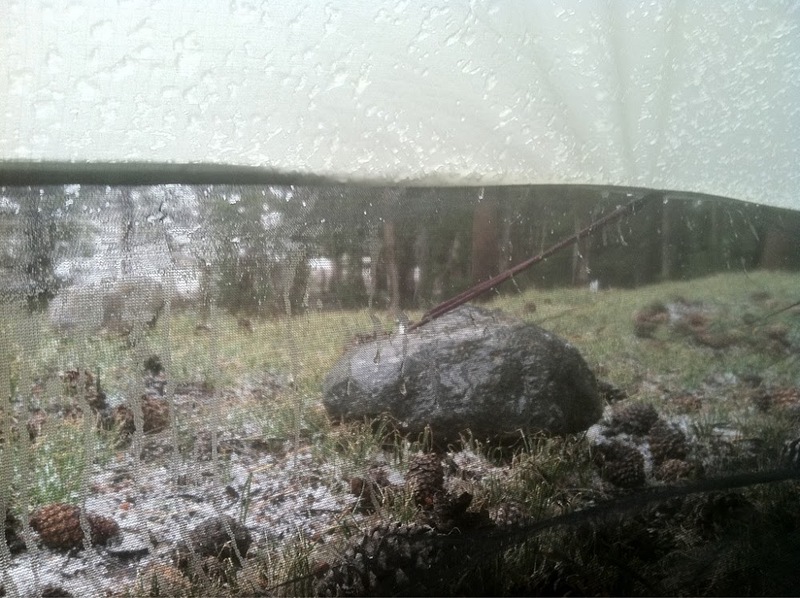 I have to hit the snow off from the inside when it accumulates too much, but there is surprisingly little condensation. We got lucky and a group of bundled PCTers (K-Bomb, Ninja, Drop n Roll) came by in the morning and brought us our bear canisters so our food would be reachable. I find it funny that we are all from Oregon where we live in tons of rain and we’re waiting this out, but it is COLD and I’m liking my rainy day break. I haven’t laid in bed like this since starting the trail! I only wish I had enough reception to watch Hulu! My MP3 player got wet in the last stream last night and played for 20min today before going out on me. I’m hoping it will recover after warming up and drying out. 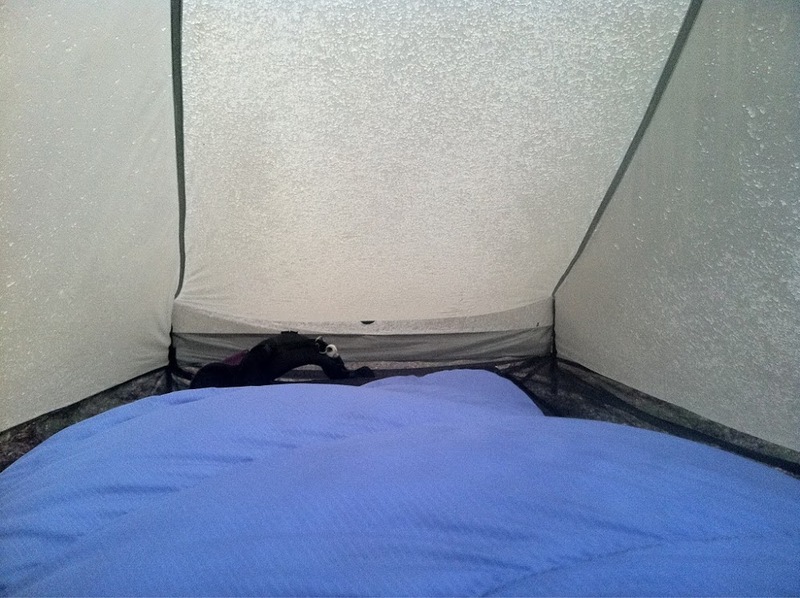 In the afternoon, Sunshine came in my tent and we played cards. 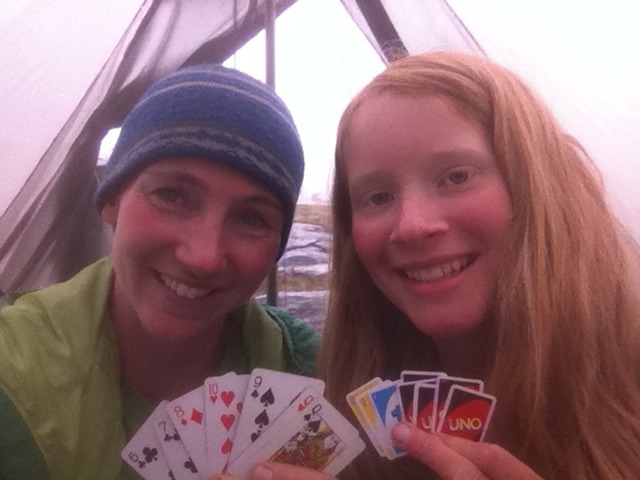 Then all three of us played cards in their tent after dinner. That was fun! We would have made the shuttle to Mammoth if we left by 2pm, but the weather wasn’t changing. We were shocked that it lasted all day and didn’t expect to wait more than a couple hours. We thought it might go away if we hiked down out of the fog, but then we risked almost definitely getting wet and then a cold wet night until the morning shuttle to Mammoth. We figure we are dry and warm now and shouldn’t push our luck. The new plan is to get going by 3am tonight and then get the morning shuttle to Mammoth. We slept so much today it should be doable unless it’s still raining.bThen we will for sure wait for daylight and then make a go for it regardless of the weather. It should be okay cause it has cleared up this evening. I think my body really needed a complete rest, so this was probably good timing. No the zero I imagined, but a zero nonetheless.